Another fascinating technology introduced to music research, theory and composition is neural network simulation. Originally invented in the 1940s to mimic the behavior of nerve cells, it was first abandoned in favor of Artificial Intelligence and expert systems before it made its re-entry into the academic realm. Michael LEE (1991), a graduate student at CNMAT in the early 1990s, wrote a MaxNet neural net object for the Max programming environment (later renamed to MLP, which stands for Multi-Layer Perceptron). During my time at CNMAT, I was involved in developing a number of applications using the mlp’s pattern recognition and interpolation capabilities. In the third scene of the first act which features excerpts from a fictitious diary (including a section with four female voices signifying the multiple personalities of the protagonist) two compositional approaches were taken and their results transformed into a popular musical idiom: A spectral one, utilizing further analysis material, and a connectionist one, featuring a set of neural networks. In the latter approach the networks were trained to either quotations from historical or popular sources or to the spectral material itself. This scene is based on the syllables „sch-rei-ben,“ „sch“ representing an independent sonic event. Since „rei“ is further divided in two distinctive parts, the overall form is quaternary. The first part consists of the playback of the same word „schreiben“ stretched by a factor of 220 accompanied by saxophone, electric guitar, double bass and percussion. The gigantic expansion of the short sample reveals microscopic details such as the long portamento from c# to g and thus yields the pitch material for the acoustic instruments. After a short transition, a fast section unfolds featuring slowly arpeggiated spectral chords in ascending motion. The spectral pitches are reached by suspensions that resolve either upwards or downwards. 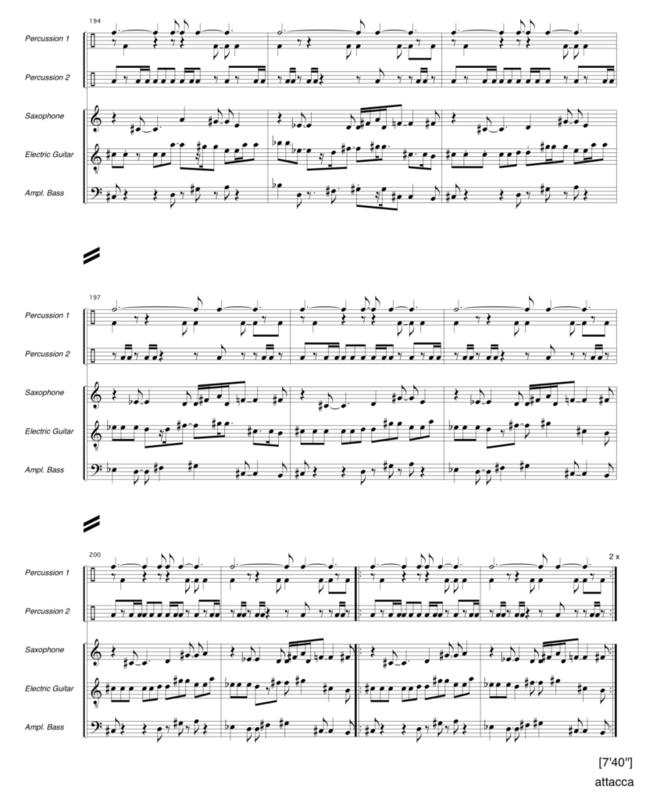 The third part and fourth parts are composed using neural networks for melodic interpolation employing melodies from the opera itself (H), from a CD with Sephardic songs from the middle ages (S) and a piece by the Rolling Stones* (R). Inspired by the idea of seamless melodic interpolation (exemplified in Clarence Barlow’s composition 1981 for piano trio), I trained a whole battery of Max mlp objects to these melodies with their respective accompaniments which allowed me to move freely through melodic space, thus generating countless new melodies (with varying similarity to the originals). Melodic interpolation is far from being a trivial problem (POLANSKY 1992). The intervallic space in which interpolation is performed is characterized by at least two distinctive properties: pitch distance (magnitude) and harmonic distance. While pitch distance is usually a function of the frequency ratio of the two fundamentals, harmonic distance is more complicated to formalize and depends a great deal on intuition and experience. I found that the circle of fifths represents a viable compromise between the two principles, in which the circularity of the chroma circle (SHEPARD 1964) is preserved and harmonic relationships are allowed to come into play. Figure 1. 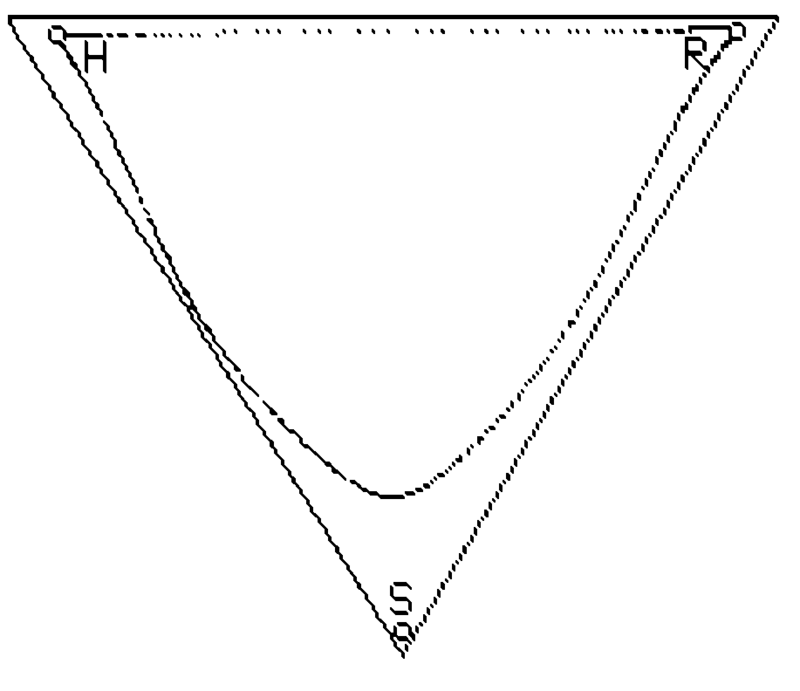 The actual interpolation involved three melodies (H, S and R) located at equal distance in the corners of a triangular melodic space and was performed over a total period of three minutes. The graph shows the interpolation path at a resolution of 1000 sample points. For the graphical plot, another network was trained to translate the input data into spatial coordinates. My paper “Circularity in neural computation and its application to musical composition” (HAJDU 1995) offers a concise explanation of the mathematical methods and the training process pursued. *Mick Jagger was an important figure in the protagonist’s personal mythology, remarkably playing the role of a modern reincarnation of Jesus Christ. There is even an account of her visit to Jaggers’s mother and inquiring about a scar on his stomach (WANTOCH 1984). The religious implications are even more outlandish considering Jagger’s occasional self- stylization as devil, and the fact that she had left out the words “Jesus Christus” in a paper she had been asked to copy.